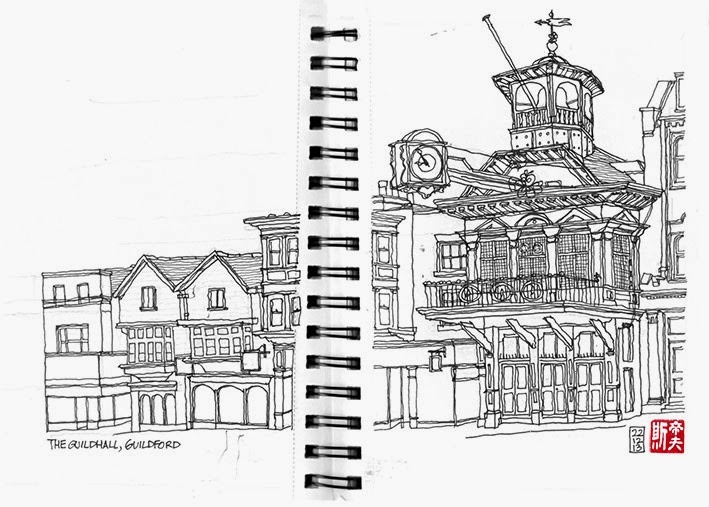 I sneaked out of the house at dawn to go sketching on Guildford High Street. After chatting to a lady who was a book illustrator and a road sweeper who carried a laminated drawing of the Guildhall in his cart, a third person took the opportunity to critique my work. The gentleman, who was smartly dressed and reeked of beer had clearly been out all night. He carried a few cans in plastic bag which caught the uncontrollable dribbles from the end of his nose. ‘That clock don’t even look like that, mate.’ I responded politely by saying that it wasn’t meant to be a photograph and anyway, I was a beginner in this particular discipline. ‘Fark awf Pinocchio, your nose is growing mate.’ I guess he didn’t believe me. I bid him good day and resumed my scribblings.